Amazon Relational Database Service (RDS) has grown rapidly since its release. In fact, in a new report, Stack Overflow reveals that traffic to RDS-related topics has increased 40% year-over-year in its community discussions. Further, traffic to topics on Amazon Aurora, a cloud-native database with MySQL and PostgreSQL-compatibility, has grown 200% year-over-year. At the same time, the number of use cases and solutions for RDS being implemented by developers continues to expand. Stack Overflow's report finds that RDS users tend to use cutting edge technologies including serverless architecture, and they are likely to use popular open source data stores including Redis and Elasticsearch. RDS users tend to be in strategic IT roles, including DevOps specialists, engineering managers, and C-level executives; and they often work in savvy industries including cloud-based services, media and entertainment, and eCommerce. Stack Overflow, the leading online community for developers, analyzed its own user data to create its report, "The Incredible Growth of Amazon RDS." The report draws on the results of Stack Overflow's annual Developer Survey to analyze topics including: the types of developers most likely to use RDS, the relationship between experience level and use of managed databases, the technologies that correlate highly with RDS traffic to various database resources on Stack Overflow, the industries and countries that most use RDS, and more. 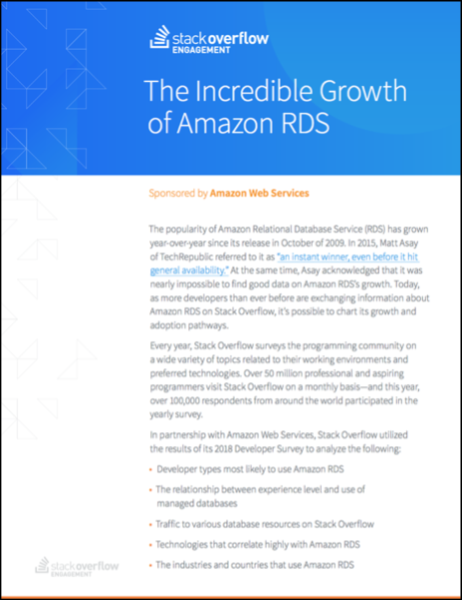 You can learn more by accessing the Stack Overflow report, "The Incredible Growth of Amazon RDS," courtesy of Amazon Web Services. Amazon RDS is growing at about 40% year-over-year in terms of traffic to RDS-related content on Stack Overflow, according to the report. Amazon Aurora in particular is exhibiting dramatic growth of about 200% year-over-year. 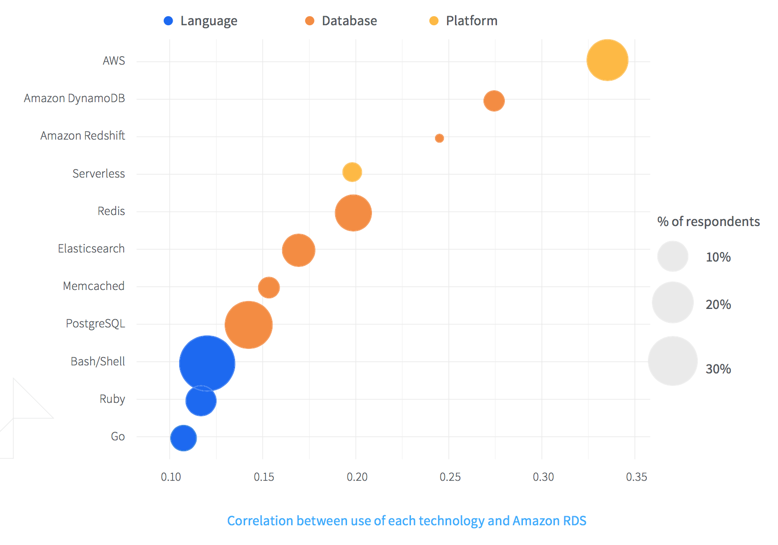 According to the report, Amazon RDS users are likely to use innovative technologies including serverless architecture, Redis, and Elasticsearch. RDS users are also likely to use other AWS technologies, including Amazon DynamoDB and Amazon Redshift. DevOps specialists are the developers most likely to use RDS, according to the report, followed by engineering managers and C-level executives. The languages most correlated with RDS, including Bash/ Shell, Ruby, and Go, are languages often used for DevOps tasks.